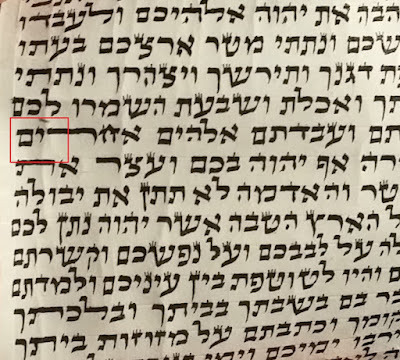 My question is: Not knowing the source of the mezuzah do we assume that the erasure was before the כ was written and it is ok, or do we assume that it was afterwards and therefore passul? We operate on the assumption that everything is done according to halacha (unless there is a strong reason to believe otherwise - such as that you know the sofer and he does not have a chezkas kashrus). Besides, this could have been the result of scraping a repairable negiya, even if done after the ksivah, could easily be allowed. I think I need to take a course on being a magiah. Anyone who give a halachic advice on the kashrut of (ie checks) sta"m needs to be a qualified magiha. There are myriads of halachot and considerations that wouldn't be know to or occur to someone without both learning and experience as a magiha. I once spoke with a guy who learned at hakotel who had semicha for ketiva. 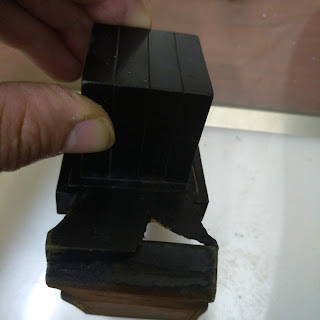 When I asked him if he was a magiha, he said "no, but I've checked hundreds of mezuzot"
I've heard from R' Shammai Gross on a number of occassions in a situation where we are in sofek about what happened but are suspect that something was done not al pi halacha then we can look at the csav to help us. If the csav is a nice, good csav then we can assume things were done al pi halacha. If not then it's definitely more suspect. This is quite general. But in cases like these I've seen him give his opinion about whether it was done in the right way at the right time, etc. Thanks Yehoshuah. 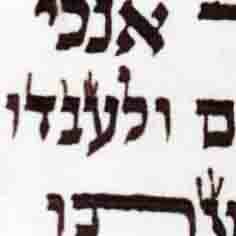 But having said that, there are many ehrliche sofrim with ksav kaballah who choose to write simple ksav at a faster rate. Their ksav is usually halachadic - just not mehudar from an aesthetic point of view. Obviously with such a mezuzah, I would be just as satisfied that the sofer knows what he is doing, even though the ksav is not mehudar. 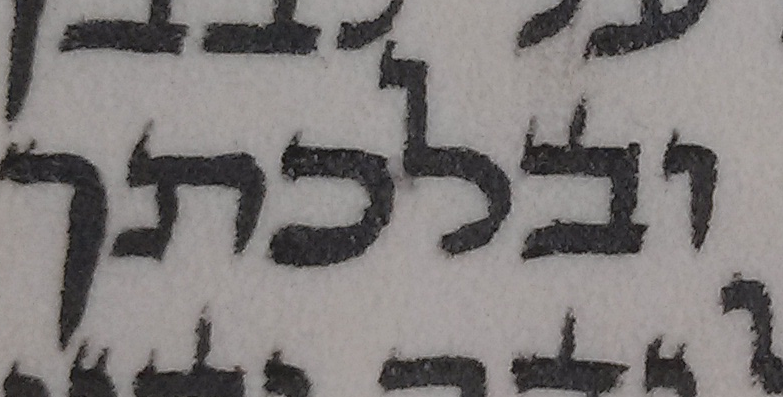 This may be the case above, where the ksav appears to be a basic - yet halachadic - Sephardi ksav. 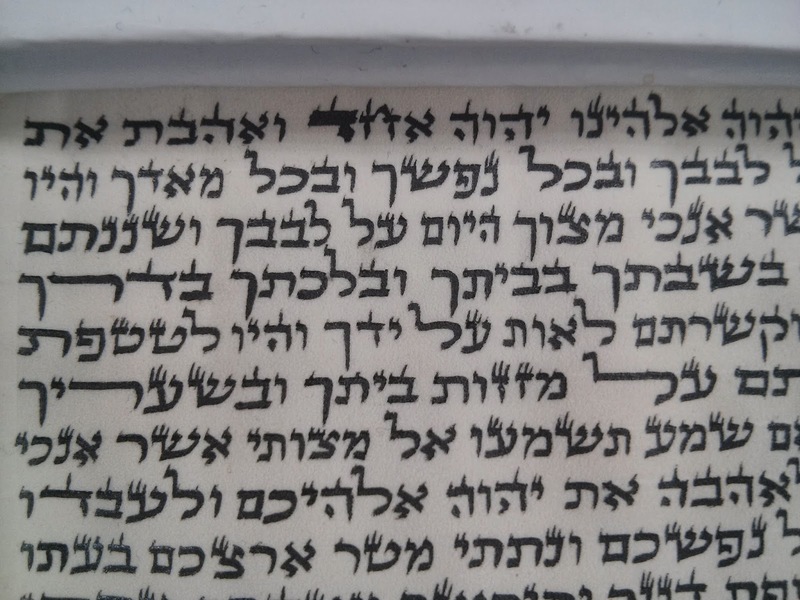 Furthermore there are sofrim with kaballah betokef whom unfortunately I wouldn't use, for example a sofer who came highly recommended was sent back a parsha with a negiya that was 100% possul. and a few months later sent back the same parsha with the negiya repaired. (It was definitely the same parsha, with the same computer code). I agree fully with all of R' Eli's comments. This ksav by no means qualifies to raise suspicion. I think it was erassed because not to touch the lamed above.